The Managing Director and Founder of Gemini Property Developers Mr. Sudhakar Rao has been recognised and honoured with the prestigious Real Estate Tycoon Inspiring Developer Award by Dubai Land Department, at the Taj Mahal Hotel in Mumbai during the Dubai Property Show Mumbai 2017. The ceremony was attended by leading developers who are driving the success of the UAE’s real estate sector. The move comes just under three months of the company’s commercial sales launch of its maiden project – Gemini Splendor – and within two months after Sudhakar Rao being named as the 19th most powerful Indian Business Leader in September 2017 by Arabian Business. Indians have invested Dh61 billion (US$16.62 billion) in Dubai real estate market in the last three years, according to Dubai Land Department (DLD), including Dh20 billion in 2015 and Dh12 billion in 2016. Indians are also the largest group of property developers who have been developing and delivering a large number of projects every year, contributing to the growth of the real estate sector on the country. Majida Ali Rashid, Assistant Director-General and Head of the Real Estate Investment Management and Promotion Center the Investment arm of DLD, commented: “We are pleased to congratulate all the winners of the first edition of the Tycoon Real Estate Awards, and want to celebrate those who have made inspiring contributions to our sector and helped us to realise our vision of making Dubai as the world’s premier real estate destination and a byword for innovation, trust and happiness. The Tycoon Real Estate Awards recognises and celebrates companies and individuals who have had a positive impact on Dubai’s real estate sector, and who through their vision, leadership and inspired contribution have significantly improved the quality of lives and elevated Dubai’s global standing as the world’s leading real estate destination. 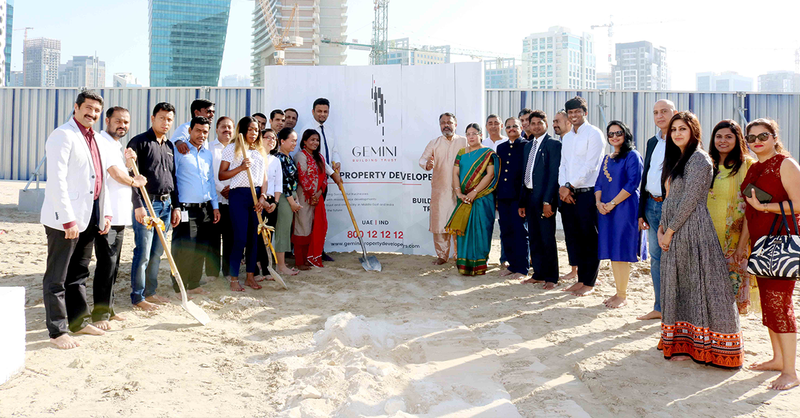 Mr. Sudhakar Rao, Managing Director of Gemini Property Developers, while thanking the Dubai Land Department, commented: “I, on behalf of my whole team, am humbled to receive this prestigious award. Besides thanking the Dubai Land Department I would like to say that Dubai is a hotspot and favourite destination for real estate investors that make our properties popular among investors coming from different nationalities. The key attractions for investing in Dubai are: attractive returns, ease of investing, high transparency and lower budget requirement. This is what inspires us to do more and better for Dubai real estate sector. The G+8-storey Splendor at MBR City has a built-up area of over 320,000 square feet including 134 residential units comprising spacious one, two and three-bedroom apartments, penthouses and townhouses equipped with state-of-the-art amenities. The high-end project is scheduled for completion in the first quarter of 2018. The first edition of the Tycoon Real Estate Awards was launched by DLD’s Real Estate Investment Promotion and Management Center as part of a comprehensive global programme that includes many initiatives and activities. Future editions will be held in other global cities including Cannes, London and New York. Historical records show that Indians can reap approximately 8–10 percent tax-free returns by investing in the Dubai real estate market ‑ without a doubt, extremely attractive capital appreciation and definitely much better than what they can currently expect in many cities in India. As per the current Reserve Bank of India norms, an Indian can remit as much as around US$250,000 per annum to Dubai, which means that it has become easier to invest in Dubai property sector for Indians. There has been a 12 percent growth in the number of travellers to Dubai in 2017 that could translate to a higher investment by Indians in to Dubai’s real estate which makes it an attractive proposition for Indian investors for a number of reasons such as prices lower than most developed cities, transparency in transactions as well as well-regulated market. On this subject, a global real estate advisory Jones Lang LaSalle report says: the issues that investors in Indian real estate have faced in the past decade in terms of delays in development, lack of exit options and high ticket sizes have also played key role in this outbound investments. The Real Estate Tycoon Award categories included: Registration Trustee, Architecture Company, Media Communications, Mortgage Provider, Happiest Community, Facility Management, Smart Real Estate Project, Customer Experience in Real Estate, Real Estate Developer – Sustainable ‘Green’ Development, Real Estate Project in Commercial Retail, Employer in Real Estate, Real Estate Project Hotel award, Most Innovative Real Estate Marketing Campaign, Real Estate Portal, Real Estate Project in Affordable Housing, Real Estate Project for Commercial Offices, Owners Association Management Firm, Real Estate Project in the Luxury Residential, Real Estate Project Master Development, Real Estate Brokerage Firm.